Like his countryman Andrea De Cesaris, Riccardo Patrese has mixed his F1 career with incredible highs and sorry lows, gradually shaking off his image as a wild man to become F1's most senior citizen. Both men joined the 200-plus club but unlike De Cesaris, Patrese eventually became a race winner, only stopping his GP counter at an amazing and as yet unbeaten tally of 256. Don Nichols of Shadow had taken notice and took Arrows to court. The design was deemed to belong to Shadow and the court judged Arrows to have used drawings of Shadow copyright to produce the FA1. An injunction prevented the Arrows team from further using the FA1, but the court proceedings had given Tony Southgate sufficient time to produce the definitive A1 model. This car was used from the Austrian GP onwards. In the meantime the FA1 had a large part in promoting young Patrese into the limelight. During the first part of the 1978 season Patrese and the FA1 had been a frontrunning combination, the Italian even leading races. So, after the South African GP Patrese was approached by Ferrari and Riccardo signed an option to join the Scuderia in 1980. But when the time had come he was told to wait until 1981 and after that never heard from Ferrari again. Their reasons for not signing him have never become publicly known. Eventually, Patrese's best result during 1978 was a second place in Sweden but his involvement in the accident at Monza the same year in which Ronnie Peterson was fatally hurt meant a big blow to Patrese's career. Peterson had not been impressed Riccardo's blocking tactics at Anderstorp, while the other drivers also accused Patrese of dangerous driving. During the investigation he was not allowed to start at Watkins Glen, many drivers including Hunt and Lauda instrumental for the suspension. He returned behind the wheel for Canada. In the prolonged legal investigation so much a part of the Italian legal system he was much later cleared of any wrong-doing. These procedures you will also remember from the 1970 Monza events and also more recently from the black Imola weekend of 1994. Young charger Riccardo Patrese made his GP debut for the Shadow team in Monaco 1977. Back in those days he could occasionally suffer from a De Cesaris-type red mist but later in his GP career he became a well-respected citizen of GP racing and very relaxed and laid-back in his appearance. Patrese enjoyed his first successes in 1973 and 1974 he when he won the European team championship together with Eddie Cheever in karting. In 1974 he also won the World Karting Championship. Ten years later Riccardo would resume his partnership with Eddie Cheever in the Euroracing Alfa. 1976 saw him win the European F3 championship. Patrese followed Rees, Wass, Oliver and Southgate to Arrows where he was to stay for four seasons until he signed for Brabham in 1982. That season also saw him take his first GP victory under quite bizarre circumstances in the blue-riband F1 race at Monaco. Due to development problems Brabham decided that Patrese should race the Cosworth engined BT49D while Piquet sat in the turbo-BMW powered BT50. 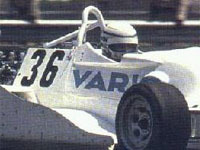 Riccardo was on pole until the dying moments of the qualifying when René Arnoux managed to set a faster time. Arnoux took the start and Prost also squeezed past Riccardo at the start. On lap 15 Arnoux hit the armco and his race was over. Prost now led by some 5 seconds ahead of Patrese. Prost now caught up with a couple of backmarkers in trouble and Patrese was quickly on his tail. With 10 laps to go a light drizzle made the track very slippery. While Prost was trying to lap De Angelis they touched wheels but he managed to pass him only to crash out of the race a few moments later when the track surface and sudden turbo horsepower caught him out. Patrese now led by a large margin but he also got caught out and spun at Loews, stalling the engine. Now 1.5 laps from the end Pironi inherited the lead but amazingly a dead battery killed his 126C2 in the tunnel. Who was in the lead now? The previously third-placed De Cesaris? No! His car came to a stop on the last lap due to fuel starvation. Was it fourth-placed Derek Daly? No! After he had also hit the barriers earlier in the race his gearbox had cried enough and seized. So who was next? Enter Signor Patrese again, having been pushed away from the Loews corner and managing to restart his trusty DFV coming down to Portier. He took the chequered flag but didn't realize he had won until he came driving by on the slowing-down lap and saw all the stricken cars… Pironi and De Cesaris took the other podium places thanks to their distance completed. But hadn't Patrese been able to restart fourth-placed Nigel Mansell and fifth-placed Elio de Angelis would have scored a Lotus one-two, being the next cars running! Difficult seasons at Brabham, Alfa and Brabham again followed this lucky shot for glory, Patrese winning one more time in a BMW-powered Brabham and losing team mate De Angelis in that horrible 1986 Ricard test crash. A move to Williams meant better times, as from 1989 on the cars were powered by works Renault engines. Riccardo took four wins in total during his time at Williams, even outpacing Mansell during the first half of 1991, but generally he was regarded as the trusty number two driver team managers could rely on for Constructor points. Patrese fulfilled this role for a final fling at Benetton, partnering Schumacher, retiring prior to the 1994 season because of the lack of serious offers. In 1995 he was lured back behind the wheel of a Schübel-entered 4WD Ford Mondeo in the German Super Tourenwagen Cup. This turned out to be a disaster. He never qualified in the top 20 and the year was marred by crashes, his best result a lowly 18th in the opening race at Zolder. In October 1996 he was invited by Frank Williams to test a FW18 at Silverstone. He thoroughly enjoyed the experience and set times that would have put him 5th on the grid for the 1996 British GP. In the early eighties Patrese had been an sportscar stalwart as well, winning ten races for Lancia during this period. He temporarily came out of retirement and renewed his sportscar activities in 1997 when he co-drove a TWR Nissan R390 in an all-star line-up at Le Mans. He wanted to put a Le Mans win to his name and the R390 looked as a sure bet for a win that year. A forced relocation of the gearbox oil cooler meant all Nissans suffered from gearbox problems and didn't last the distance.